Havana (VNA) – A Vietnamese delegation led by Vice Chairman of the National Assembly’s Committee for External Relations Vu Hai Ha attended a workshop held recently in Cuba to honour national hero Jose Marti. Addressing the event, Ha said Vietnam and Cuba share the aspiration for peace, progress, development, solidarity and a world where each person can “live with everyone and for the interest of everyone”, as desired by Jose Marti. The official reiterated Vietnam’s commitments to fulfilling all 17 UN Millennium Sustainable Development Goals set in 2030. He also made proposals to help each country’s legislative body contribute more to the realisation of the goals. 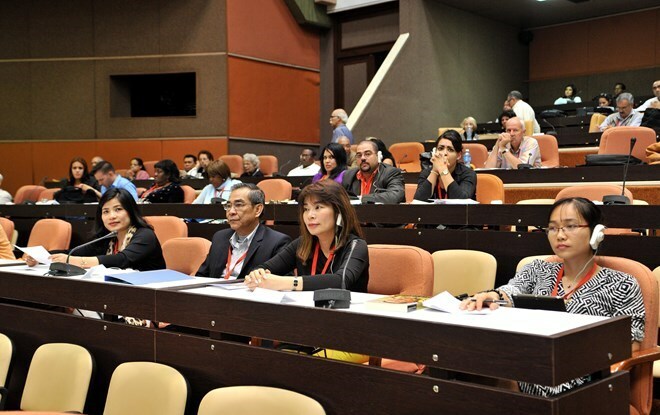 The workshop, organised by the Cuban National Assembly and UNESCO, saw the participation of 500 scholars, social activists, legislators and politicians from 50 countries worldwide. The event marked the163rd birthday of Jose Marti (January 28, 1853).